“We do not know with full clarity [coyotes] their desires or motivations. Coyote is a unique Keystone Carnivore, very capable of living among us, alongside us, near us. Other Keystone carnivores like wolves, grizzly bears, mountain lions tend to remain far away from human habitation. And as a result, the ecosystems where we live can often lack balance and be ecologically impoverished. 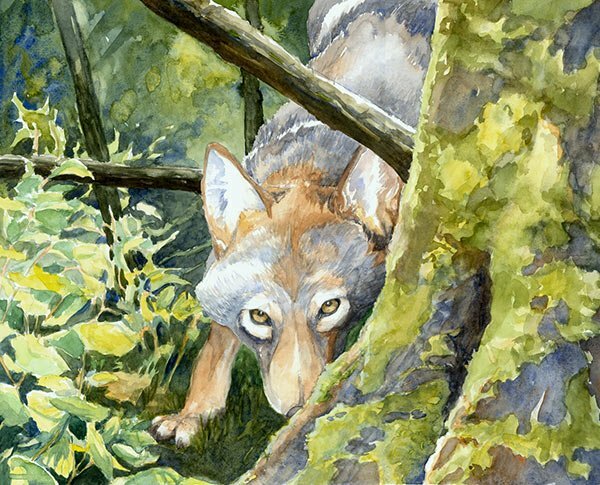 So Coyote’s presence among us enriches the landscape and all the life that is there, including our own. However, the knowledge of how to live with this carnivore has not been handed down to us. Because our European ancestors had no knowledge of the value of carnivores and feared them, they had only one relationship with them ….they feared them …they killed them. So we belong to a generation that has been given a challenge to reconsider our relationship with carnivores. We know so much more about them through our science, and so we have a choice: hand down to our children the continued killing of our carnivores, or teach ourselves how to live with them. What would you choose? It is an invitation to understand what life is like for a wild Coyote. What is happening in their life at different times of the year: Winter, Spring, Summer, Fall…and what is happening in their home, their territory: is their forest being clearcut, is there drought, severe winters, starvation, do you understand that Coyote likes to be out during the day as much as you do, do you know who Coyote’s preferred wild prey are, do you understand that coyote likes to walk on trails as much as you do, do you understand that each coyote is a unique individual and each one relates to us in their own way, do you understand that a coyote “reads” you…. It is an invitation to understand how our behaviors affect theirs. Do you use rodent poisons in your home, do you feed wild birds who attract coyote’s prey to your doorstep, do you allow your cat to roam outside without your supervision, do you let your dog outside unsupervised, do you know the respectful behaviors you should practice during Coyote’s pup rearing time, do you know how to behave when you and coyote unexpectedly meet each other when you are walking in their territory, do you allow people to kill coyotes on your land? This is what this website is about…then fear goes away and respect takes it place. Coexistence requires learned skills that are practiced, passed on and shared. So the more we try to understand life from the Coyote’s point of view, and the more we understand how our behavior affects the behavior of coyotes, the more we will understand that Coexistence is possible. COYOTES ARE NEVER TO SEE US AS A SOURCE OF FOOD … EVER! NEVER feed coyotes intentionally or unintentionally. Do not feed your pets outside ~ all pet food should be stored inside, that includes food for your domestic livestock. Pick up fruit that has fallen from your fruit trees ~ coyotes have a sweet tooth and like diverse kinds of fruit. Keep your compost enclosed and secure. Keep your trash containers well secured, and do not leave trash bags out overnight for the morning trash pickup. Though research has shown that coyotes do not tend to eat trash…they much rather have their wild food…..in leaving trash out, they will come to understand that humans are a source of food. Use wise judgment when feeding wild birds. In fact, think twice before you feed wild birds. Remember, they are wild and fully capable of finding their own food year round. If you have fed them in the past, in order to enjoy seeing them, think instead of ways that you can plant flowers and trees and shrubs that will draw them to your yard. Create habitat for them. A caution with bird feeders: Because they draw many other animals to them other than birds, including some of coyote’s favorite wild foods ~ rodents. And in drawing coyote’s favorite foods close to your house, you may draw coyote close to your house as well. We want to keep our coyotes and all wildlife wild! Keep your pets in sight while they are outside, even if you have a fenced yard. This is particularly true after dusk when many wildlife species become active. Keep cats inside, or provide an outdoor area that is secure and protected. This not only keeps your cats safe but also many songbirds as well. Domestic cats are taking a heavy toll on our native songbird populations. If your dog does not stay close to you off leash, then keep them on a leash in natural areas and particularly from April to August, when coyotes are raising their pups. 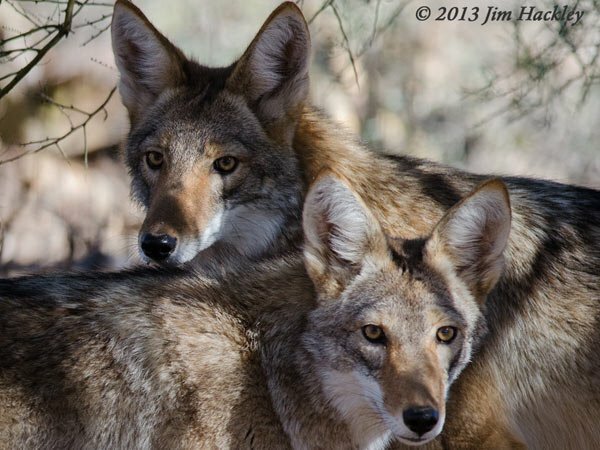 Coyotes, like all wild canines, are very caring and protective parents. If your dog is running free near a coyote’s den at this time, the parents may see your dog as a threat to the safety of their pups, and respond accordingly. If you find yourself in this situation, restrain your dog, and backtrack on the route you took, and this will often lead you out of a den area and away from the protected pups. Remember ~ every coyote has their own unique personality, just like us. Some of them are very shy, some very curious, some bold, some reclusive, some engaging. Also remember that a coyote that was born in April will look like a mature adult coyote in November ~ but they are still learning about their world which is new to them, and they are not mature. 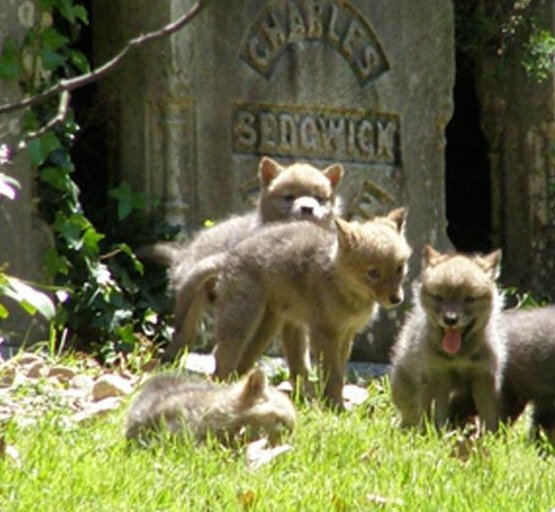 By this time of the year, pups that were born in the spring will spend time in their parents’ territory independently, or one that is quite the adventurer will disperse from the parent’s territory. 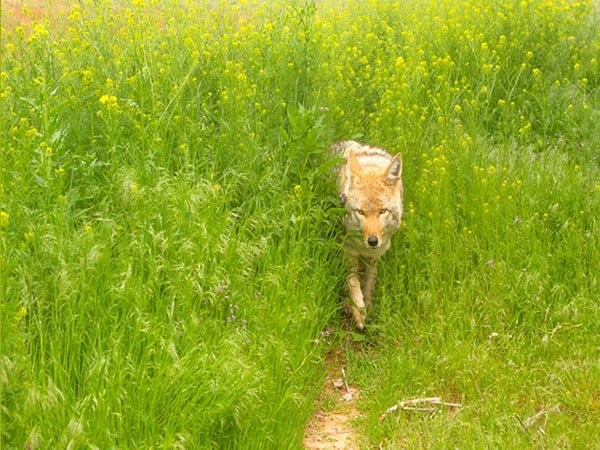 If you are walking in a natural area and a coyote approaches you, know that he or she may be a very curious inexperienced coyote who is wondering who you are, or he or she may also be a more curious or bold coyote. In either case, allow them their safe space, and DO NOT RUN AWAY from them. If you have a small child or a tiny dog with you in this situation, pick them up. If you are frightened, throw your hands up in the air to make yourself look big and yell out loudly. However, healthy wild coyotes by this time have turned on their heels and are gone. If not, you can throw sticks in their direction to send them off. Because a coyote approaches you, it does NOT mean that they have Rabies. If you have knowledge about this, you can protect yourself from all the “fear media” that is out there. Research has shown that coyotes have the lowest level of rabies of any land mammal in North America: .01 of 1%. Coyotes are very intelligent wild canines, and in their encounters with us, they will often try to “read” us. So if a coyote stands still and stares at you for a while before turning on their heels and running away, they are “reading” you. It doesn’t take them long to do it either! Our learning to interpret coyote behavior is like our attempt to “read” them as well. But if we allow fear to dominate an encounter, we allow it to take away from the encounter. And doesn’t this sound familiar …because we do these same things with our fellow humans. Another misconception that many people have is this: If a coyote is seen during the day, there is something wrong with them. Remember that this is a FALLACY. Coyotes, like other carnivores, like to be out in the daytime just like us. The reason we will not see them often during the day is because they have been so persecuted on our continent, that they hunt at dusk and early morning to protect themselves from us. You may tend to see them more during the day from April to August because coyote parents have to hunt much more in order to feed their pups. 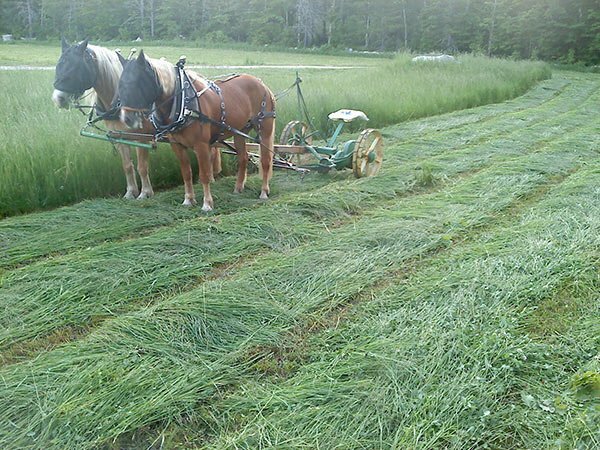 On farms where coyotes feel safe, they will often mouse during the day after the farmer has mowed his field. know that both the land and You are richer for it!